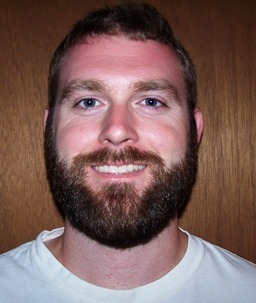 The Arkansas Game & Fish Commission recently hired native son Marcus Asher as its full-time “quail program coordinator” to lead the state’s mounting bobwhite restoration efforts. With a B.S. in Wildlife Ecology and Management from Arkansas State University and three years of research on bobwhites and early-successional songbirds, the Jonesboro, AR native worked the past five years as a private land conservationist with the Missouri Department of Conservation. Prior to that, he was a soil conservation technician with the Natural Resources Conservation Service in Tamms, IL, and as an area technician III with the Arkansas Game and Fish Commission. He also holds certifications in basic fire training, prescribed burn boss training and prescribed burn plan writing. Asher says his immediate priorities include revising and expanding bobwhite management efforts on selected state wildlife management areas, enticing adjacent private landowners to implement quail-friendly practices to increase usable space on a larger, landscape scale, developing strategies for keeping those landowners engaged long-term, convincing other land-owning partner entities to embrace the state’s quail management priority and strengthening the commission’s public education and outreach efforts targeting bobwhites. Bobwhites have become a hot topic in Arkansas. Earlier this month, the commission convened a day-and-a-half meeting on bobwhites with their biologists, wildlife management area managers and several experts from other states to share their experiences. Just last month Arkansas was one of eight states included in a National Bobwhite Conservation Initiative (NBCI) proposal approved by the Natural Resources Conservation Service under its Working Lands For Wildlife program. It will provide technical and financial assistance to landowners interested in converting exotic, endophyte-infected fescue pastures to drought-tolerant native grasses and wildflowers, along with developing prescribed grazing plans. Arkansas also has the nation’s first NBCI bobwhite focal area anchored by a National Park Service unit, Pea Ridge National Military Park. Asher is stationed at 1125 Hwy 56, Calico Rock, AR 72519. He can be contacted at 870-291-4243 or Marcus.asher@agfc.ar.gov. Headquartered at the University of Tennessee Institute of Agriculture’s Department of Forestry, Wildlife and Fisheries, NBCI is an initiative of the National Bobwhite Technical Committee (NBTC) to elevate bobwhite quail recovery from an individual state-by-state proposition to a coordinated, range-wide leadership endeavor. The committee is comprised of representatives of 25 state wildlife agencies, various academic research institutions and private conservation organizations. Support for NBCI is provided by the Federal Aid in Wildlife Restoration Program, state wildlife agencies, the Joe Crafton Family Endowment for Quail Initiatives, the University of Tennessee and Park Cities Quail. For more information, please visit www.bringbackbobwhites.org and find us on Facebook, YouTube and Slideshare. The National Bobwhite Conservation Initiative (NBCI) moved a step closer to two of its major goals for landscape restoration of wild bobwhites – reconnecting cattle and quail, and reconnecting forests and quail – when the Natural Resources Conservation Service (NRCS) announced the approval Tuesday of two NBCI-led proposals to recognize bobwhites in the NRCS Working Lands for Wildlife (WLFW) program. “With a goal of affecting 232,000 targeted acres in 13 states by fiscal year 2018, this WLFW accomplishment may be the largest concentrated effort ever applied to reintegrating wild bobwhites into this nation’s working landscapes,” said NBCI Director Don McKenzie. The grasslands proposal targets 150,000 acres in eight states — Arkansas, Illinois, Indiana, Kentucky, Missouri, North Carolina, Ohio and Virginia — and will provide technical and financial assistance to landowners interested in converting pastures of exotic, endophyte-infected fescue to drought-tolerant native grasses and wildflowers, along with developing prescribed grazing plans. Additionally, the Center for Native Grasslands Management at the University of Tennessee has offered to provide “Train the Trainer” sessions for partner biologists and NRCS staff on establishing and managing native grasses for grazing and wildlife. 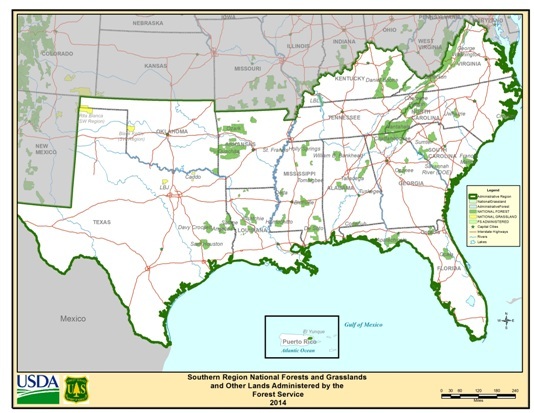 The forestlands proposal targets 82,000 acres across six states – Alabama, Florida, Georgia, New Jersey, North Carolina and South Carolina – and will provide technical and financial assistance to landowners interested in restoring declining pine savanna habitat using native grasses, timber thinning and prescribed fire. Pine savanna is a diverse ecosystem supporting bobwhites and more than 300 other species. The National Bobwhite Conservation Initiative (NBCI) has taken another significant step in the recovery of native vegetation and habitats on the landscape across the 25 NBCI states with the release of a new decision-making tool, NatiVeg, NBCI Director Don McKenzie announced today. “With restoration of native grasses, wildflowers and shrubs across the landscape being a critical means to the recovery of bobwhite, grassland bird and pollinator populations, NBCI’s NatiVeg will make it significantly easier for landowners and resource managers to select the right native plants for their specific location and specific purpose,” said McKenzie. NatiVeg (www.quailcount.org/NatiVeg) is a remote, Internet-based tool that works on desktops, laptops, tablets and mobile phones. Developed by NBCI and University of Tennessee Institute of Agriculture Information Technology Service and beta-tested by a variety of outside reviewers, NatiVeg is a database that, within the 25-state initiative’s range, delivers the proper native plant choices for a specific location and the user’s specific purposes, whether wildlife, forage, biomass, pollinators, critical area planting, restoration or soil conservation. That location can be specified either manually or by a connected mobile device’s GPS system. And the provided recommendations discriminate, for instance, between a big bluestem grass adapted to Texas and one adapted to Alabama based on location. An eight-month project, NBCI first captured the database for the 126 Natural Resource Conservation Service’s (NRCS) Major Land Resource Areas (eco-regions) for the 25 NBCI states and secured the NRCS database of plant materials identified as suitable for conservation purposes. NBCI deleted from that list all non-native species, tree species and other species not applicable to the NBCI states, leaving only native grasses, shrubs, forbs and legumes in an eventual 306-species menu. NBCI then folded in a plant hardiness zone database into the mix. Also provided is a species “Location Assistance” button that delivers information from the respective state wildlife agency, including contact information for experts. “There are still shortcomings to overcome,” McKenzie said. “For instance, there are many plants that NRCS has not done any work with, so are not included. In addition, there won’t be as many choices east of the Mississippi River because NRCS has worked more on western species. So, NatiVeg is a work in progress. For questions and more specific information, contact NBCI Grasslands Coordinator Jef Hodges at jhodge34@utk.edu or at 660-351-2766. 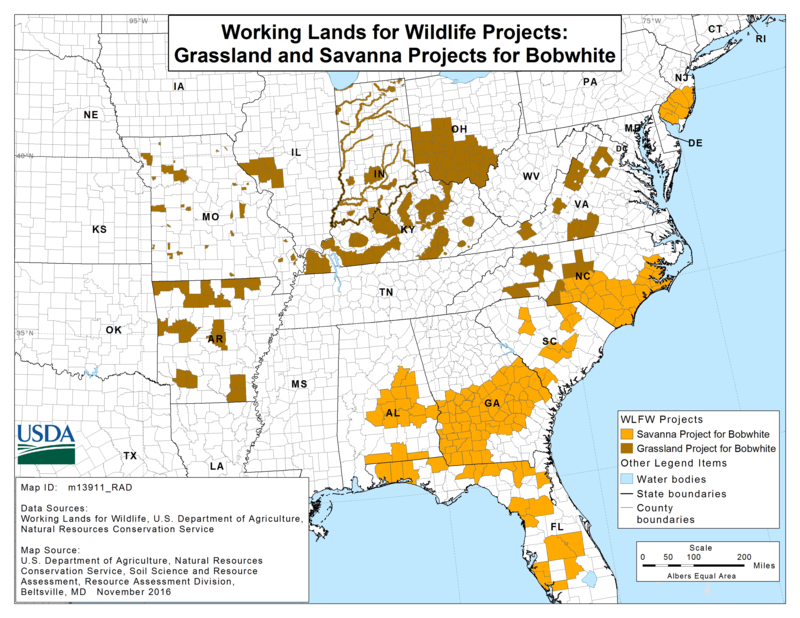 A new campaign to support using native grasses in federally-subsidized conservation programs on agricultural lands and the creation of a new technical website tailored to the needs of state biologists for reporting and analyzing habitat assessment and bobwhite/songbird monitoring results are among but a few of the highlights in the 6th State of the Bobwhite Report 2016 from the National Bobwhite Conservation Initiative (NBCI). The 66-page annual report also examines a creative approach in Arkansas for monitoring a bobwhite focal area at Pea Ridge National Battlefield, the new relationship between NBCI and the U.S. Forest Service and what it means for bobwhite restoration on national forests, as well as delving into an enormous amount of bobwhite research being conducted in Oklahoma. Also included are reports from states on their accomplishments in bobwhite conservation. 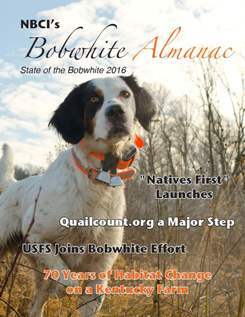 Check out “NBCI’s Bobwhite Almanac, State of the Bobwhite 2016” on the NBCI website at https://bringbackbobwhites.org/download/nbcis-bobwhite-almanac-state-of-the-bobwhite-2016/. Bobwhites, native plant species and pollinators have a new ally in their corner with the recent signing of a Memorandum of Understanding between the National Bobwhite Conservation Initiative (NBCI) and the U.S. Department of the Interior’s National Park Service (NPS). Inked recently at the Association of Fish & Wildlife Agencies annual meeting in Philadelphia, PA, the pact allows the two entities to work together with the NBCI state wildlife agencies to collaboratively identify and restore native grasslands habitats on suitable park properties, with certain park units serving as bobwhite focal areas. NPS officials have initially indicated there are as many as 20 parks across 10 states that have expressed interest in potentially participating in a project focused on grassland restoration and focal area development. NBCI’s Coordinated Implement Program requires NBCI focal areas to have a minimum of 1,500 acres along with specific and consistent measures of habitat quality, bobwhite and grassland songbird response and bobwhite covey measurements. Sixteen states have created one or more of these areas, and more states are in the planning stages. The first focal area in Arkansas (and the first on NPS property) is centered around Pea Ridge National Military Park, which demonstrated the viability of NPS involvement. “NBCI’s Coordinated Implementation Program has strong appeal to a variety of outside parties,” said NBCI Director Don McKenzie. “The National Park Service is a unique and unexpected ally that brings an entire suite of new resources to the table, including a public land base, management staff and technical expertise, and they want to contribute to the effort. Their participation offers a number of positives, including continued expansion of bobwhite restoration across the range, the development of new source populations of bobwhites, opportunities to expand park-based efforts to adjacent public and private lands, and new opportunities to tell the story of bobwhite and grassland bird decline to a broad public audience,” McKenzie said. Headquartered at the University of Tennessee Institute of Agriculture’s Department of Forestry, Wildlife and Fisheries, NBCI is an initiative of the National Bobwhite Technical Committee (NBTC) to elevate bobwhite quail recovery from an individual state-by-state proposition to a coordinated, range-wide leadership endeavor. The committee is comprised of representatives of 25 state wildlife agencies, various academic research institutions and private conservation organizations. Support for NBCI is provided by the Federal Aid in Wildlife Restoration Program, state wildlife agencies, the University of Tennessee and Park Cities Quail. For more information, please visit www.bringbackbobwhites.org and find us on Facebook, www.facebook.com/bringbackbobwhites and YouTube www.youtube.com/user/BringBackBobwhites . More than 20,000 National Park Service employees care for America’s 413 national parks and work with communities across the nation to help preserve local history and create close-to-home recreational opportunities. Visit us at www.nps.gov, on Facebook www.facebook.com/nationalparkservice, Twitter www.twitter.com/natlparkservice, and YouTube www.youtube.com/nationalparkservice. “Bobwhites on the Brink,” a five-part series by the syndicated television conservation news magazine This American Land airing this fall, examines the reasons for the decline of the iconic northern bobwhite and efforts to restore it on the American landscape. The National Bobwhite Conservation Initiative (NBCI) and various states worked over a period of months to help develop the story. Crews visited South Carolina, Texas, Kentucky and Kansas to illustrate how a decline in active forest management, the conversion of livestock grazing operations from native grasses to exotic fescue across millions of acres at taxpayer expense, and the hyper-growth of mechanized clean-farming techniques in row crop agriculture over time have combined to decimate habitat range-wide for bobwhites and other grassland birds and wildlife species. In the first segment (#601), the show examines forest management trends, which have seen the majority of grassy forest and woodland savannas that historically harbored bobwhites and numerous other species dwindle to a tiny fraction of their original range, often to be replaced with overgrown, stagnant and unhealthy forests ripe for wildfires and insect invasions. Wildlife and forest managers in South Carolina show how thinning and regular prescribed fire are bringing “bob” back to the woods. The second segment (#602) illustrates how ranchers in Texas are successfully grazing livestock in pastures of native grasses alongside bobwhites, in contrast to producers in many other states who have replaced native grasses with the exotic fescue, which offers little for wildlife and has detrimental impacts on cattle health. Segment three (#603) visits the epicenter of fescue, Kentucky, to observe what fescue has done to the landscape there and in other states, and how some producers are reverting to native grasses to benefit not only cattle growth and health but also bobwhites and other grassland species. Segment four (#604) takes viewers to Kansas to see how agricultural operations in the U.S. have morphed from small field/multi-farm operations to giant corporate expanses of row crop acreage, and how Kansas is leading the country in demonstrating how bobwhite habitat can still be successfully integrated on these working lands. The last segment (#605) summarizes the issues and obstacles that have pushed bobwhites and other grassland species from the landscape, and the strategies being used by a multitude of states and the NBCI to ensure their continued role in rural American life. “We hope this effort will move public understanding up a notch on what has happened to the bobwhite and an array of other grasslands wildlife species, including pollinators, and what we all can do to ensure this iconic bird remains on our nation’s rural landscapes,” said NBCI Director Don McKenzie. Because This American Land is a syndicated program, not all public television stations broadcast it. If they do subscribe to the program they also have the option to air it on dates and at times of their choosing, so viewers are encouraged to check the programming schedule of their local public television affiliate. Copies of the programming are also being distributed to the quail coordinators of the 25 NBCI states for use in the field with a variety of audiences. For more information about NBCI, please visit www.bringbackbobwhites.org. Headquartered at the University of Tennessee Institute of Agriculture’s Department of Forestry, Wildlife and Fisheries, NBCI is an initiative of the National Bobwhite Technical Committee (NBTC) to elevate bobwhite quail recovery from an individual state-by-state proposition to a coordinated, range-wide leadership endeavor. The committee is comprised of representatives of 25 state wildlife agencies, various academic research institutions and private conservation organizations. Support for NBCI is provided by the Federal Aid in Wildlife Restoration Program, state wildlife agencies, the University of Tennessee and Park Cities Quail. For more information, please visit www.bringbackbobwhites.org and find us on Facebook, YouTube and Slideshare. NE, recently. The award is presented to recognize an individual’s overall contributions to bobwhite research and/or management during a career. NBTC cited Dr. Brennan, a professor who holds the C.C. Winn Endowed Chair in the Richard M. Kleberg Jr. Center for Quail Research at Texas A&M University, Kingsville, specifically for his positive national influence on quail management, and his support of NBTC and the National Bobwhite Conservation Initiative (NBCI) within the wildlife profession during his 33-year career. In addition, NBTC recognized Dr. Brennan’s research on six species of quail across nine states, his more than 170 scientific publications and more than 105 extension publications, many of which established the course for today’s quail management and research activities. 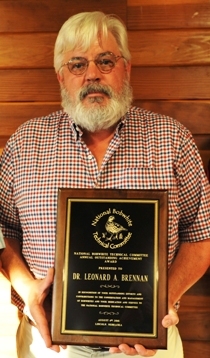 Dr. Brennan was also a central figure in the South Texas region’s designation as the first-ever NBCI Legacy Landscape for Northern Bobwhite Conservation. He was also editor of the award-winning 2006 book, Texas Quails: Ecology and Management, Texas A&M University Press. Dr. Brennan has also been actively involved in the NBTC (and its predecessor, the Southeastern Quail Study Group) as the elected “academic representative” on the groups’ respective steering committees, and has played an integral role in the national quail symposium series – leading a national strategic workshop for Quail 3, chairing and editing Quail 4, and serving as an associate editor for the upcoming Quail 8 in Knoxville, Tennessee. Bobwhite and grassland songbird enthusiasts may want to check their local public television outlet for the program “This American Land,” Season 6. The season’s first five episodes – Bobwhites on the Brink – join the National Bobwhite Conservation Initiative (NBCI) and biologists in several states to examine the decline of bobwhites and associated species caused primarily by changes in the way we manage forests, grow crops and graze cattle – and what can be done to make room for them on the landscape again. The accompanying trailer, compliments of This American Land, provides a sneak peek. The National Bobwhite Conservation Initiative (NBCI) has taken another major step in supporting the bobwhite restoration priorities of the NBCI member states with the development of its highly anticipated technical website, www.quailcount.org. The site helps meet the demand for technical services related to the NBCI Coordinated Implementation Program (CIP), and other state and partner programs. The new site complements NBCI’s public outreach website, www.bringbackbobwhites.org, but meets state wildlife agencies’ desire for centralized and secure data management. It includes information on the CIP monitoring protocols (breeding bird survey, fall covey counts and habitat assessments), the NBCI 2.0 Conservation Planning Tool and the NBCI Inventory, as well as the upcoming Quail 8 symposium next year in Tennessee. While serving many purposes for the NBCI states, the national database reduces individual state costs for data management, analysis and reporting, while the large pool of data increases the value of scientific analyses. The geospatial version of NBCI 2.0, known as the Biologist Ranking Information (BRI), provides access to NBCI state agencies’ priority bobwhite areas through an interactive web map (www.quailcount.or/briwebmap.html). BRI is also accessible to biologists in the field through a geo-location feature that extracts BRI information for the user’s location. Monitoring protocols and training associated with implementing the NBCI CIP are well illustrated with V1.0 of a habitat assessment manual and various “how-to” videos that are continuous works in progress. “For biologists only”–As a technical website some services are available only to participating partners, and a top request from state agencies was a centralized and secure database for quail and songbird abundance data. Quailcount.org offers an online data entry system for states participating in the CIP. As of March 2016, the NBCI database had over 10,000 observations. Quailcount.org is also the primary website for the upcoming Quail 8 national technical conference. NBCI and the Tennessee Wildlife Resources Agency are co-hosting the Eighth National Quail Symposium in Knoxville in July 2017. The preliminary program is published with abstracts for 80 presentations. (Quail hunters will particularly like six abstracts viewable in the program that cover bird dogs and hunting efficiency). In a first-of-its-kind pact, the National Bobwhite Conservation Initiative (NBCI), the U.S. Forest Service (USFS), the Georgia Wildlife Resources Division and the South Carolina Department of Natural Resources have entered into a formal agreement to establish NBCI bobwhite focal areas in conjunction with national forests in the two states. The Forest Service’s national office set aside $100,000 to support the on-the-ground habitat restoration process on their lands. NBCI bobwhite focal areas comprise several thousand acres in an area that has been classified as “high” or “medium” priority in the context of the feasibility of habitat restoration achieving the predicted bobwhite population response to management. The intent is to create and manage suitable habitat on a sufficient enough scale that bobwhite coveys can survive over time and, in the process, clearly prove that habitat is the fundamental missing piece in declining bobwhite populations. In addition, the bobwhite habitat created also provides habitat for a number of declining priority songbirds, pollinators and other species. The focal areas involve the Oconee Ranger District of the Chattahoochee-Oconee National Forest in Georgia (the Oconee Quail Focal Area) and the Enoree Ranger District in the Sumter National Forest in South Carolina (the Indian Creek Quail Focal Area). Mid-story hardwood removal on 200 acres of pine will be an emphasis with this new money in Georgia, as well as the development of a management plan for the area that may be used as a template for other national forest lands. Fire line construction for future prescribed burns and the seeding of those lines with native weeds and wildflowers will be the immediate focus in South Carolina. The Georgia Department of Natural Resources (DNR) is comprised of six divisions which carry out DNR’s mission to sustain, enhance, protect and conserve Georgia’s natural, historic and cultural resources. As one of six divisions within DNR, the Wildlife Resources Division (WRD) is charged with conserving, enhancing and promoting Georgia’s wildlife resources, including game and nongame animals, fish and protected plants. WRD is comprised of three sections – Game Management, Fisheries Management, and Non-game Conservation. The mission of the South Carolina Department of Natural Resources is to fulfill the public trust doctrine by serving as the principal advocate and steward of the state’s natural resources.